Many people use the words strategy and tactics synonymously. The military doesn't and, as chukar hunting is akin to a search and destroy mission, I won't either. According to Merriam-Webster, strategy is defined as a careful plan to meet the enemy under advantageous conditions, whereas tactic is defined as a method of employing forces in combat. Strategy is the big picture; tactics are the details. Generals strategize; sergeants make tactical decisions. What are the best strategies and tactics for hunting chukar? Fundamentally, my approach is to cover as much ground where chukars are likely to be as quietly as possible. No matter how hard you and your dog hunt, you won't bag any chukars if they're not there. In the previous section, I explained where to find chukar. 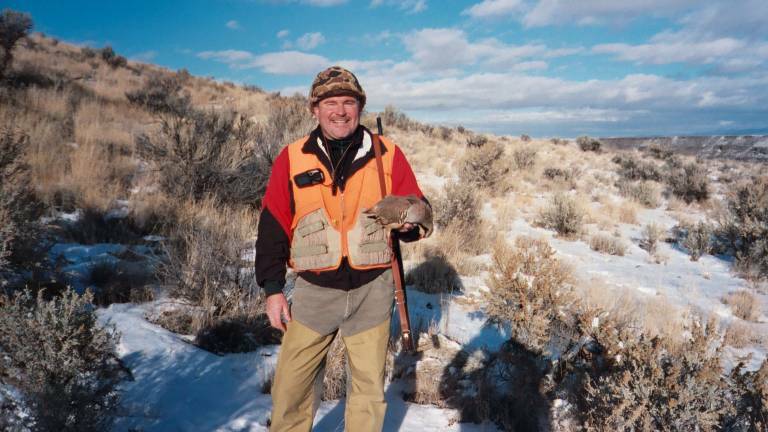 In this section, I'll explain how to find and bag the wily and elusive chukar partridge. 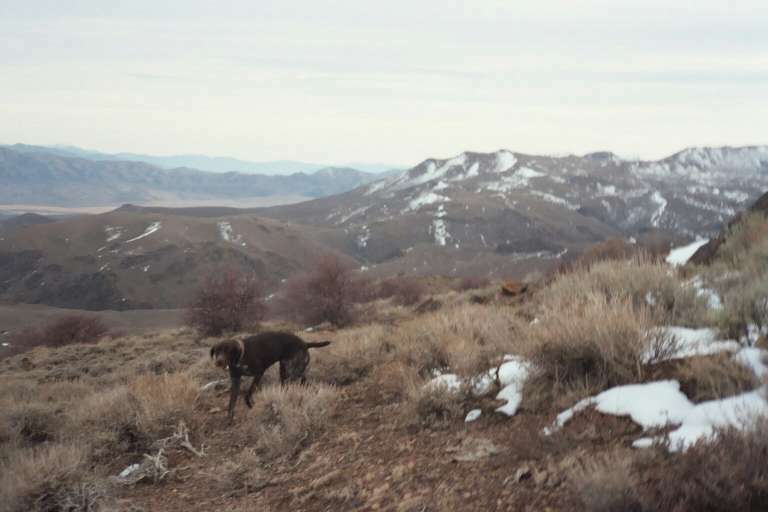 Chukar hunting can be exhausting for you and your dog. You have a finite amount of energy; you must utilize it in the best way in order to maximize your opportunities to take chukar. My Grandfather used to say that chukar run uphill and fly down the other side; it is still just as true today. I used to run them down (up) when I was younger. This stratagem may seem like lunacy, and I'm not debating that, but it does work. Even though chukar can run faster than you, they'll stop and look to see if you're still coming or hide behind a rock for a bit. Buddy Levy, who wrote what was has been called "the masterwork on the subject of chukar hunting", was taught this technique by his father and relates its successful use several times in his book . The last time I tried this method, I ran uphill until I no longer cared if I EVER bagged another chukar. I was still sitting on a rock wheezing when my dog flushed the covey far above me. I'm not young enough, or cardiovascularly fit enough, to run down chukar anymore. I don't think it was ever a good strategy. If you see chukar above you, try putting a rock outcroping or ridge line between you and the covey, before you move uphill. Once you're out of sight, they'll usually slow their ascent or even stop altogether. You can then climb up above their level before traversing back over the chukar and coming down on top of them. I have used this tactic successfully many times. The chukar will hold better and you won't have to chase them to the top of the mountain only to watch them fly down the other side. Your mantra should be, vertical equilibrium. Don't give up your elevation if you don't have to. In familiar areas, I often plan my hunt before I leave home. My goal is to minimize the amount of vertical that I have to traverse during a day of hunting. I hunt as perpendicular to the fall line as I reasonable can. I look at the topography as far ahead as I can in an attempt to connect the most promising chukar habitat (rock outcroppings, cheat grass terraces, rimrock access chutes, perennial honey-holes...) with the least amount of elevation changes. 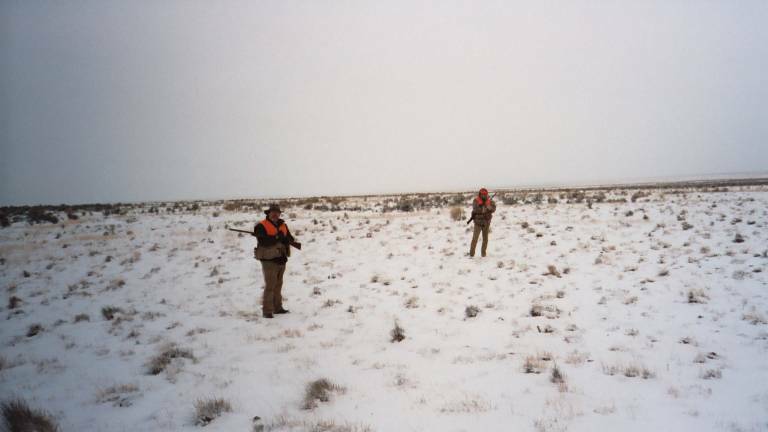 As an example, I most commonly hunt chukar with two men and one dog. Historically, this has been me, my son or my brother, and my chessie, Bones. Beginning in the 2002-3003 hunting season, our then 2 year old, started German Shorthair, Annie, has accompanied us. This arrangement is particularly well suited to the river canyons. We'll start out at the rim and hunt parallel to the canyon. One of us will walk above the rimrock and one just below. The dog will work above and below as access permits. The hunter above the rimrock is presented with straight away and quartering shots as the chukar flush ahead or away from the canyon and snap shots at birds bailing over the rim. Chukar will drop out of range quickly on one of these gravity-assisted takeoffs. The low man often gets more opportunities, albeit more difficult ones, as the chukar flushed from above result in high speed crossing shots. Halfway through the hunt, we'll drop 1/3 or 1/2 the way down into the canyon and hunt a lower parallel back to where we started. With this strategy, you'll have to hump it back up to your vehicle at the end of the hunt when you are most tired. The total amount of vertical is the same in both directions, but if you take the low route on the way back, you'll have a chance to intercept the birds you flushed into the canyon as they climb back up to the rimrock. 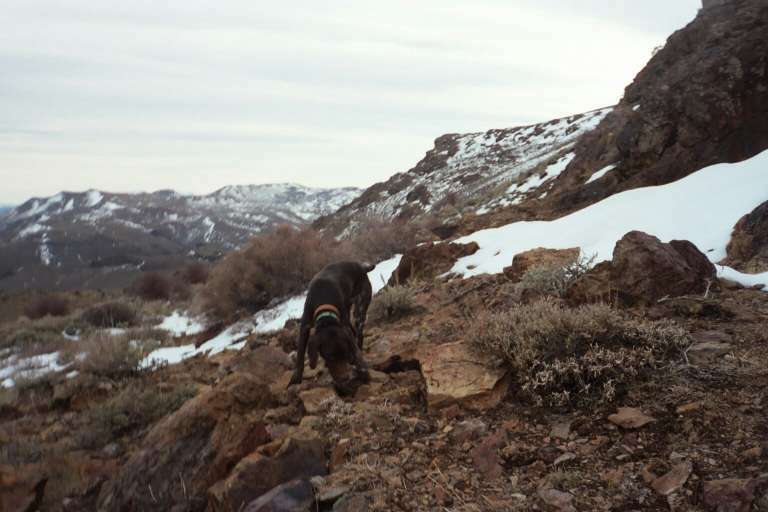 My favorite strategy was to start low, climb up and hunt other game birds along the way (California quail, pheasant, Erckel's francolin, turkey) and get into the chukar zone by 9 a.m. The wind starts out coming downslope into the dog and starts to shift upslope around 9 a.m. That's the time to be in the zone as you are now on top of the birds and they are not going to run. The dog scents them and creeps down to them and pins them on finger ridges or protected washes. You are in the best position coming down on the pinned birds as your vantage point for shooting is great. When you're done for the day, you can gradually angle down to the rig and hunt the busted covey. I've also been able to watch birds fly and swing wide to the left/right and they'll glide to a location where I can mark and get to later. The birds tend to congregate by calling and slowly head up that finger ridge. That's where I want to be coming down when I go back to the rig. Tod lived on the islands for 18 years. His experience is worthy of study. His experience is consistent with my knowledge of chukar behavior. If (when) I get the opportunity to hunt chukars in HI, I will definitely give his strategy a go. I mixed in some tactics in the examples above; I hope you didn't mind. The formation of your hunting party will affect the success of your hunt, but, by considering chukar tendencies, you can maximize your shooting opportunities. Hence, your tactics should be adapted to the composition of your party. In the canyon example in the previous section, note that both hunters and the dog were aligned along the fall line. Since chukar want to fly downhill when flushed, this arrangement allows both hunters to fire at the chukars as they attempt their escape. If your dog has been trained on directionals, guide your flusher to hunt from a little below the low hunter's parallel up through about 35 to 50 yards above the high hunter. You can let your pointer work the same range, and further depending on his training and how well the birds are holding. Another tactic that my son and I have used successfully for many years is to have both of us above the rim. One of us will hunt near the rim hoping for shots at nearby chukars and at birds making for the rim that were moved by the inland man. The inland man will hunt 50 to 150 yards from the rim, depending on terrain, and the dog in between. You'll be too far apart to talk without risking a premature flush, so both men should key their movements off the dog and from hand signals. As previously mentioned, chukar will forage away from the rim. So don't be afraid to venture out yourself. Trust your dog, if he gets birdy and heads inland, follow him! You will likely be rewarded. Depending on how often and how far the dog goes inland, this can make for a lot of leg work for the rim man. Ah, who cares? Chukar hunting is for the young and the strong. And the doggedly determined. 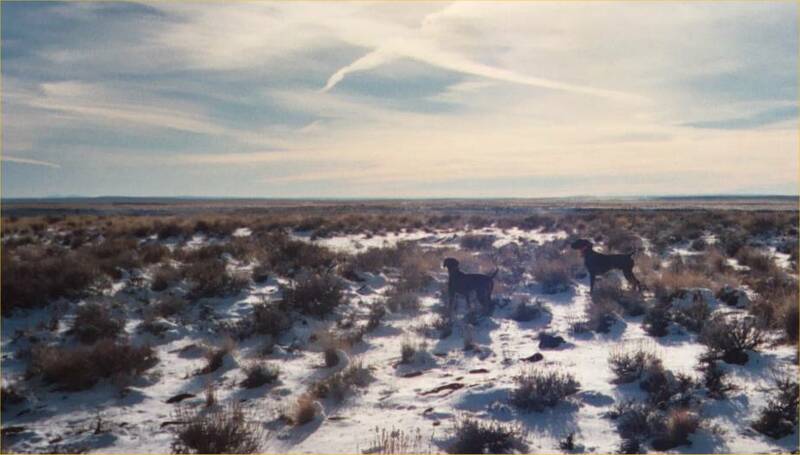 With two men and two dogs, it can be advantageous to hunt different elevation contours a couple hundred yards apart. I still like to keep the two pairs (hunter and dog) aligned along the fall line. If the high man flushes a covey, the low man still has the possibility of a shot. If the low man intercepts a covey, the chukars are likely to run uphill to make their escape. If you are the low man, signal the high man and let your dog track the covey uphill at a reasonable speed. Don't let yourself get out of breath; you can't shoot if you can't breath. Slow down or stop your dog as necessary. If you are the high man, watch the low dog and slowly make your way downhill to his position. As the two parties converge, the covey will often hold for a good shooting opportunity. The chukars can't run uphill because the high man is there and they don't want to fly downhill past the low man. If you have a pointer, and the covey is holding, try to pinch the chukar between you and your dog. This is a variation on the high man, low man tactic. If you successfully execute a pinching maneuver, you'll have an easy shot. Easy, that is, if you consider firing a shotgun on a steep, precarious, rock-strewn slope easy. It's not for me. There is another option. When you have sufficiently closed the gap, stop on a spot with decent footing and give your pointer a release command. Gasp! Do I mean let your pointer flush the covey? That is exactly what I mean. I know dog training purists and field trialers would NOT approve, but it is a very effective tactic. I would not use it with a pointer in training or one that was not completely staunch; it could cause a problem. However, the chukar hunter that got me started has used this technique with his shorthairs for a couple of decades; it has worked with his pointers and it works with mine, so it's not exactly untried. There is no controversy for the retriever men though. Find a nice spot to stand, get ready, and let your flusher work! My best and most important tip for solo hunters, and it goes doubly for myself as I know better but do it anyway: Don't hunt chukar alone. Find a buddy to go with you. The desert is a harsh environment and if you fall and break a hip (or worse), you are in a world of hurt cuz there ain't nobody out there. I do chukar hunt by myself, but I tell my wife exactly where I'll be hunting and call her every night. I also carry a FRS radio along. These precautions mitigate the risks to some extent. I hunt chukars mostly by myself; a little tough to get others interested in rock climbing with a gun. 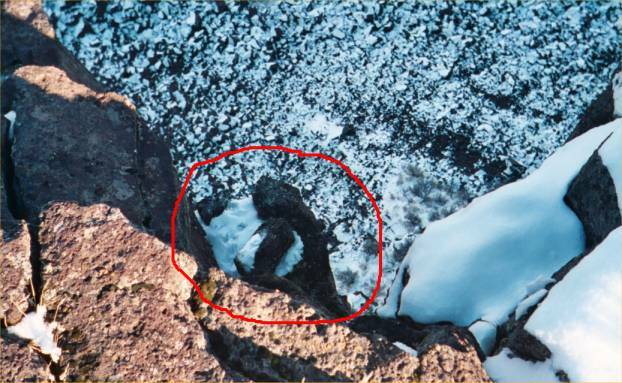 I disagree with shooting down off the rim, It's tough to find the bird once you've found a way down and you spend a lot of valuable time looking just to see that the bird has fallen into a bottomless hole in the rocks. As I've mentioned, I hunted over my Chesapeake Bay Retriever, Bones, for many years. Retrievers have some disadvantages for hunting chukar, but they are damn good at bringing downed birds to the bag. Knowing this, when I was by myself, I would stay on top of the rim and mark the spot where the chukar landed. Bones would go down and bring it back up to me. If he had trouble finding the spot, I would give him hand signals from above just like a "blind" waterfowl retrieve. In some areas, the rim is hundreds of feet high or more. Access below the rim from above can be difficult to impossible. In these situations, shooting chukars going over the rim may not be feasible. I had to pass on the two chukars that were sitting on this little shelf just below the rim due to access problems. If you zoom in on ledge in the picture, you can just make out their footprints. Good luck. You're gonna need it. I'm only half kidding, it's a lot harder, but there are things you can do to increase your chances. For starters, go back and study my Where To Find Wild Chukar Partridge page. You are going to have to rely on your eyes, ears and chukar knowledge, instead of your dog's nose and hunting instinct. Try using a chukar call. If you can get the birds to respond, get out your binoculars and glass the slopes. A covey of chukar will frequently perch a sentinel on a rock outcropping or the tip of a prominent rock as a lookout for predators. This sentry can be seen silhouetted against the rocks. If you're lucky. If you manage to locate a covey of chukar by sight or sound, try to get above them and come down on top of the buggers. The chukars are much more likely to hold if you are above them. If you come up from below them, 9 times out of 10, they will just run uphill. Once you've moved a covey, try to spot where the main group touches down. The chukars may land out of sight, but at the very least, you have an idea where they've gone. Try to get near where they went down, stop and listen. Within 5 or 10 minutes, you will usually hear the chukars, the main group and the scattered ones, calling to each other to reassemble. I have several chukar calls, I don't know how many exactly. The one I like the best and use exclusively is marketed as a squirrel call, but it makes the best chukar sound of any that I've heard. 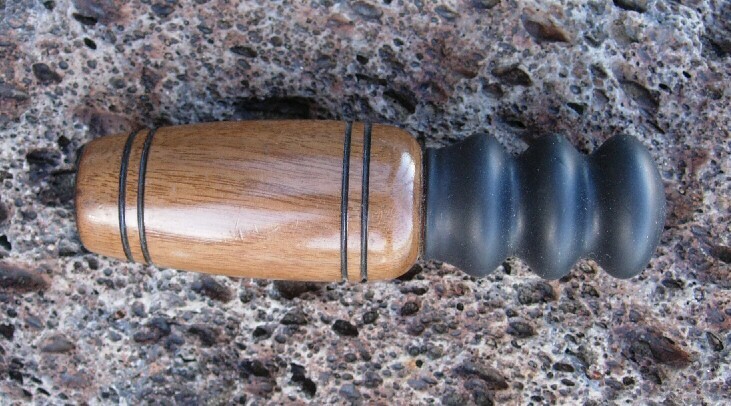 It looks and is used just like a standard chukar call, wood barrel on one end powered by a rubber bellows on the other which you tap with your hand. It is much easier to demonstrate than describe the calling technique, but I'll give it a go. I start by pointing the barrel of the call toward the area I'm targeting. I then compress the bellows of the call against the palm of my other hand, hard at first then tapering off in volume but increasing in cadence for a total of 10 chuks or so. I'll listen for a minute or two and then repeat the call, usually pointed at another hillside. I don't think it's worthwhile calling more than a few times every half hour or so when you're not seeing birds. You don't want to spend more time calling than hunting. Just doesn't make sense. So if you haven't seen or heard any chukars for awhile, combine calling with a rest stop. Sit down, make a few calls and listen while you drink some water and a have a snack. Even if the chukars don't respond to your calls, you'll be rehydrated and rejuvenated. Unless you're hunting young, uneducated birds, a.k.a. juveniles, very early in the season, chukars are skittish and prone to spook hundreds of yards in front of you. Birds that have been hunted hard do not hold well and it is more important than ever to be quiet. If you talk to your hunting partners and yell directions or whistle to your dog, the chukar are likely to flush far out of gun range. I don't think it's possible to get up on a covey without them seeing you, but you'll get closer before they flush if you're quiet. If you can't talk, how do you coordinate the hunt with your partners? My son and I carry chukar calls which, in addition to their intended use, we use to alert one another without spooking the chukars. We then use hand signals, which my son learned at a very early age, to convey information, (birdy, on point, I see 'em...) and coordinate the hunt. I even use hand signals for my dogs. Directionals, stay and come are adequate and not hard to teach. These signals also come in handy for teaching a blind retrieve so you'll earn double benefit for your trouble. Unfortunately, when your dog is hot and heavy into bird scent, he may not look to you for directions. Retrievers are notorious for going faster and faster as they approach birds, but some pointers do to which may scare the chukar before the dog locks up. Stay up with your dog if you can but instruct him to stop if you can't. The covey may flush, but if your dog bumps the birds 75 yards in front of you because you swallowed your whistle, you'll only get to watch them fly. My GSP Annie goes slower and slower as she tries to locate chukar. She often starts creeping 100 or 150 yards out and slowly advances like a lioness on the hunt until she locks down the covey. If we are too far behind during the creeping stage, she will pause on a soft point and slowly turn her head to look back for us until we catch up. I don't know how to teach this method to a pointer, but it works really, really well. A chukar in the bag is worth 20 in the rock. Memorize this. Once a chukar goes down, one thing and one thing only should be on your mind. Getting it in your bag. Don't worry about being quiet; you've just fired your shotgun. Whistle for your dog and yell at your hunting buddy and get him over there ASAP. Keep your eyes on the spot where the chukar landed. Don't look anywhere else. If your gun is empty, snap the safety on and load it back up as you make your way down to the landing zone. If you can't do this blindfolded, practice. If your wounded chukar gets up and runs, shoot him on the ground. Don't try to save a shell and don't wait for your dog to get there. Chukar can run 28 miles per hour (45 kilometers per hour) uphill. You can't. Your dog can't. Ground sluice him. By the knight's code, it is the only chivalrous thing to do. While chukar hunting, you may have incidental wingshooting opportunities. Depending on locale, you may find quail, sage grouse, Hungarian partridge, even ducks and geese sharing chukar habitat. I have also seen cottontails, deer, antelope, elk, wild mustangs and burros and desert big horn sheep while chasing chukar. 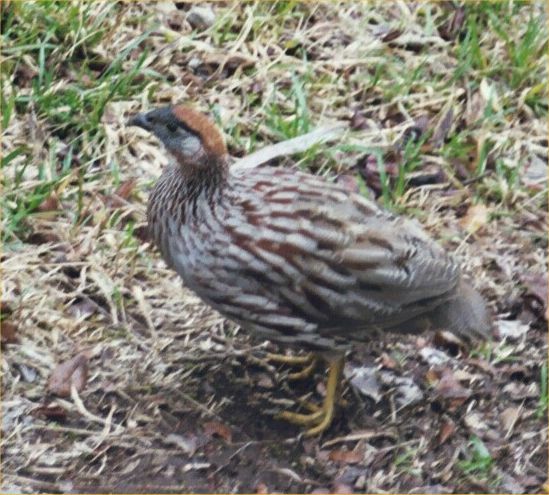 In the Hawaiian Islands, you are likely to encounter Erckel's francolin and California quail. Gray francolin, black francolin, Gambel's quail, Japanese quail, ring-necked pheasant, Kalij pheasant, Rio Grande wild turkey, and Chestnut-bellied Sandgrouse are other upland game birds which can be hunted on the islands. If you want to make the most of your chukar hunting trips, read the fish and game regulations, buy the required tags and licenses and bring incidental ammunition and gear. I do. I've been known to bring waders and decoys on chukar hunts and bag waterfowl and chukars on the same day.